When we announced the happy news of Bamm-Bamm’s arrival, the first question many family members and friends asked was: how is Birdy dealing with becoming a big sister? Already during pregnancy we tried to explain to Birdy that there’s a baby in mommy’s belly. Not an easy concept for someone around the age of two to grasp, but she seemed to understand. As my belly grew bigger, she would sometimes poke the baby never quite having the patience to wait until he pokes back. For a while one of her favorite games was shining a flashlight on the belly for the baby to see. I found it hilarious because that’s exactly what we used to do while she herself was in the belly to encourage her to turn head down. 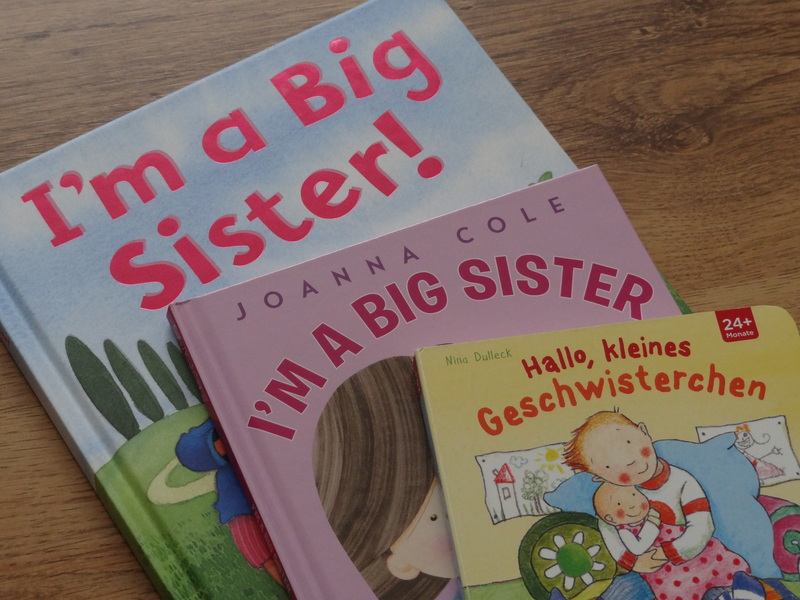 To prepare Birdy for her role of a big sister we bought her a few books. They were all pretty clear on one thing: babies are boring little creatures who sleep, cry, and need new diapers, and cannot do anything fun like play, walk, talk, or eat good stuff like ice cream. In a nutshell, it’s pretty cool to be big and help mommy and daddy take care of the little one! Once the due date came closer and we built up the baby’s bed, I explained to Birdy that the baby is growing bigger and soon won’t have enough place in the belly, he will come out and sleep in the little bed. From that day on I was no longer allowed to put anything in the baby’s bed. Birdy would swiftly remove it because otherwise there will be no place for the baby! She did make one thing clear though: the baby will not be allowed to play with her toys. When Birdy saw Bamm-Bamm for the first time at the hospital she didn’t quite know how to react or what to do with him. She found the little wrinkly, sleeping creature mildly interesting and, from the looks of it, also a little stressful. During our first days at home she liked to watch him eat or get a fresh diaper, but preferred to keep her distance. We respected that and let her take things at her own speed. The warming up process has been very gradual – the first time Birdy touched the baby when he was around a week old, the first group hug followed a week later, and the first kiss on the cheek happened when he was a month old. Currently, 6 weeks in, she brings Bamm-Bamm his toys and tries to play, loves helping me by passing diapers when I’m changing him, and pets his back telling that everything will be ok when he cries. Birdy’s observing how I’m handling the baby and tries to do the same. Whereas I’m standing by and trying to find the balance between encouraging her to interact and making sure she’s being sufficiently gentle and careful with him. In the beginning having a little brother didn’t change Birdy’s life much. Sure, she had to share some attention but the new addition to the family was sleeping for such long stretches that it barely affected her daily routines. This has been slowly changing as he’s awake for longer periods of time and Birdy isn’t always happy with that. I try to keep her entertained, e.g., by reading books together while nursing him and, instead of feeling bad about not spending as much one-on-one time with her as she (and I) would like, I remind myself that independent free play and mommy not jumping up to help with every little frustration are, probably, good for her in the long run. The biggest change in Birdy’s routine is her dad completely taking over the daycare drop-off and bedtime. That, combined with more daddy playtime while I’m busy with her brother, is making her into daddy’s girl more than ever and she’s willing to do anything (even go to bed!) as long as he’s doing it too. It seems that she’s accepted the fact that she has to share mommy but dad she’s keeping all to herself. Birdy is becoming a wonderful big sister and it’s completely okay if she’s not always happy with this new role. Having two younger siblings myself, I understand it all too well.